The Hurricane 16 Sportsman was designed for offshore use on lake, bay or ocean. With the exceptionally wide beam of the soft riding hull plus high flared sides, you can sit comfortably in the broad deep hull. You have added protection of a handsomely crowned forward deck. You will enjoy the superior performance of the tredonic bottom ... fine forward sections for smooth, soft ride, ample dead rise for carrying heavy loads at high speed ... and straight parallel lines of the running bottom for maximum efficiency when operating at top speed. 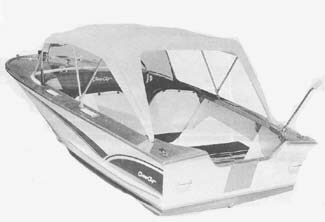 The Hurricane decking arrangements offer the flexibility to suit any boatman's needs with either the Sportsman version as shown here, or the Runabout with the large open cockpit area. BOAT KIT INCLUDES: All cross-frames from select mahogany, preassembled transom reinforced with 3/4" solid mahogany framing. Rugged 1 3/4"thick solid mahogany stem, keel, battens, etc. All longitudnal and other cross-framing parts and seats pre cut from solid mahogany. Side and bottom planking is genuine marine plywood. Also screws, complete, illustrated instructions, and marine glue are included. FRAME KIT INCLUDES: Pre cut 1 3/4" solid mahogany stem. Three frames and one intermediate cross-frame cut and notched from solid mahogany. Two sheer shelves and two transom knees. Transom cut from 3/4" marine plywood framed with 3/4" solid mahogany. Complete plans, patterns and building instructions are also included. 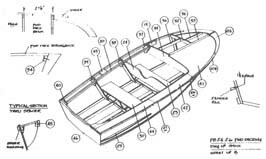 Drawings show, one of many step by step assembly drawings supplied with our boat kits. Note all kit parts are numbered to correspond with the drawings for easy assembly.